While out to dinner with friends last week, a special request was made by my friend Wendy for a peanut butter chocolate dessert. 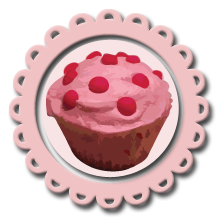 The only successful peanut butter chocolate recipe I’ve made is a cupcake recipe- and Wendy has already had those- so I wanted to try something different. 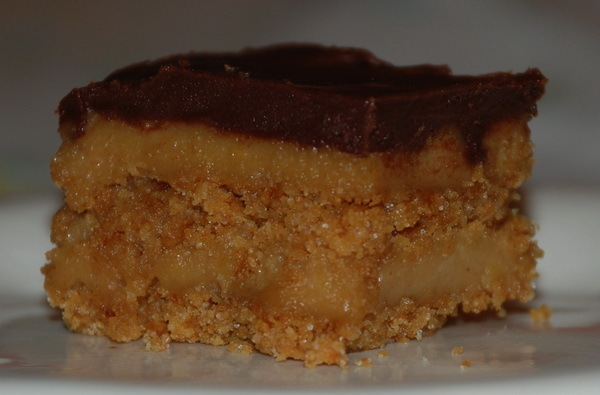 Fortunately, Karen came to the rescue with a decadent recipe from fincooking.com called Chocolate Glazed Peanut Butter Tart. It looks like a big peanut butter cup sliced into pie wedges. Mmmmm! I opted for individual bars instead of a large pie, so I baked mine in a 9x 13 inch glass baking dish. Soon after I spread the peanut butter mixture, I realized that my pan was too big, so I precariously cut the dessert in half and placed one half on top of the other for two layers. In the future, I would use a 9 x 9 inch square cake pan or a 9 1/2 inch round tart pan (as the recipe called for). You can substitute chocolate or vanilla wafers for the graham crackers. My variation made 16 small bars. Beware- these are quite decadent and addicting! Susan is allergic to chocolate and it was hard to keep her away from them! Blend the graham crackers in a food processor until finely ground and place in a small bowl. Mix the sugar into the graham cracker crumbs. Pour the butter into the graham cracker crumb mixture and stir until well combined. Press into an ungreased pan (9 x9 inch square baking dish or 9 1/2 inch round tart pan). Whisk the egg yolks, brown sugar and flour in a small bowl until well blended, set aside. Combine the peanut butter and vanilla extract in a measuring cup, set aside. Heat the milk and salt in a medium saucepan over medium heat just until simmering. Slowly pour the hot milk into the egg-sugar-flour mixture, whisking constantly. Return the mixture to the saucepan and cook over medium heat, whisking constantly until it thickens and comes to a full boil, about 3 minutes. Continue to cook and whisk for another minute. Remove the pan from heat and whisk in the peanut butter and vanilla until well blended. Pour the peanut butter mixture over the cooled crust and spread evenly. Press a piece of plastic wrap directly on the filling’s surface to prevent a skin from forming. Refrigerate the tart until cold, at least 2 hours. Finely chop the chocolate, set aside. Melt the butter in a double boiler. Add the chocolate and remove from the heat. Whisk constantly until the chocolate is melted. If it gets too cool to melt, return it to the double boiler just until it is warm enough to melt. Remove the pan from the fridge and remove the plastic wrap. Pour the glaze over the filling and spread it evenly. Refrigerate the pan until the glaze sets, at least 30 minutes. This entry was posted on Saturday, October 18th, 2008 at 8:54 pm	and is filed under Bars. You can follow any responses to this entry through the RSS 2.0 feed. You can leave a response, or trackback from your own site. These are definitely Peanut Butter cuppy. Yummy! I had them when they were still a bit soft, so I’m looking forward to a possible taste-test in their final form. your best peanut butter concoction yet. when you going to blog about that chocolate pepper cake?? ?